Winter descended with a will last weekend, after a shot across the bow around Thanksgiving, when we had a fine dusting of snow to grace the festivities. This second bout was more an attempt at a broadside of sleet and ice. Thankfully most of it overshot us, although I hear that Virginia and points north were hit fairly roundly. We had just enough to slickify the roads and confine us indoors most of the time. So we spent part of the weekend in the kitchen, cooking citrus peels, preparing a Christmas pudding batter, and making block gingerbread. At this juncture I am all about the block gingerbread: it's fascinating, and the more I test, the more interesting it becomes. 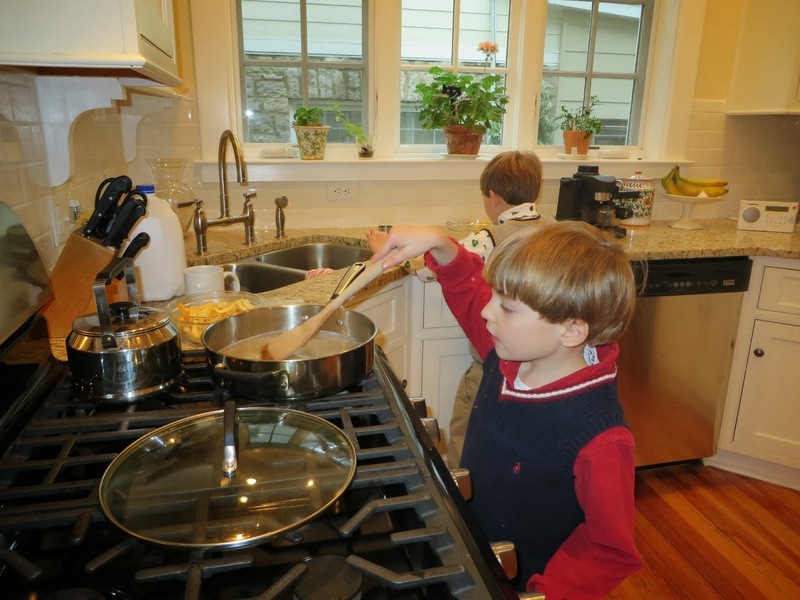 Christopher enjoys cooking very much and is getting to the point where I am turning over measurements to him, and he is learning to handle a wooden spoon stoveside. It's a joy to see him absorb his new skills, and to watch his face when he tastes the work of his mind and hands. Christopher stirs the peel candying in the saucepan. Noah, by contrast, thinks of it as advanced play with Mama's tools. My back turned for a moment, and Noah piled the flour bin, all the cookie cutters, and bowls onto the kitchen scale in a rickety pile to see what it might weigh, and what might happen next. 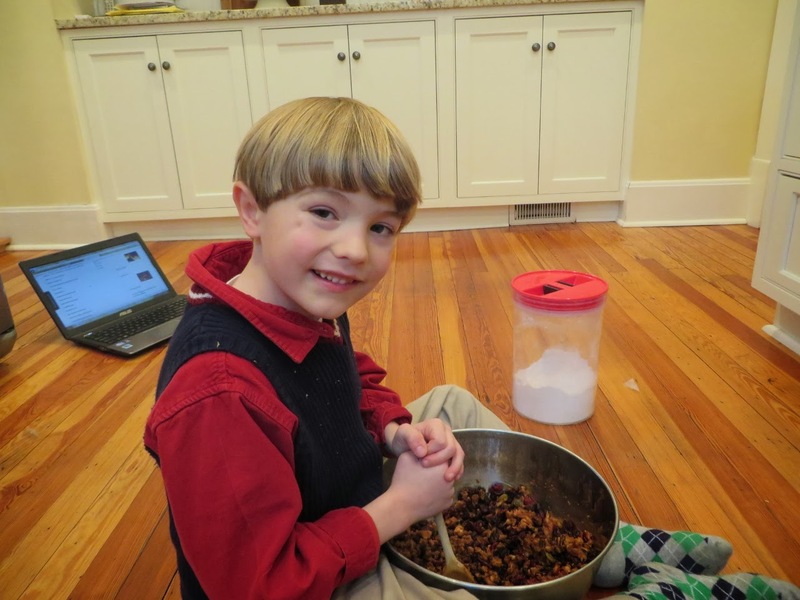 Yep, he's an adventure in the kitchen, but unless he is rolling and patting and "testing" dough, he's not over-interested, so tribulations were thankfully few, because he trotted off to his Tinkertoys. Sunday afternoon saw three productions. First we made mixed candied orange and lemon peel. Wonderful, and the syrup left over? Oh-my-goodness-I-am-hoarding-this-essence-of-citrus-grove-to-sweeten-my-tea-and-no-I-don't-want-to-share. If you get a chance, do make it. It's easy, you get to have orange fruit salad afterwards, and everything gets used except the seeds. What's not to love? Christopher said it was fantastico. The peel Christopher and I made to go into a traditional Christmas pudding, one of Isabella Beeton's recipes. I used Fashion-Era's copy of the recipe, from the 1928 version of the cookbook, though substituting butter for suet, which I do not care for. There is quite literally more than a pound of fruit in this recipe, and so it makes multiple puddings. Good. We have one for next weekend's Christmas tea, and one for our own delectation. Curte was somewhat anxious about this, as he stepped into the kitchen at one point and asked point-blank. The house was smelling very good. The peel also went into the gingerbread, and the house still smells good, because I am still experimenting with it. Yes, I cook on the floor and use my legs as a bowl vise. 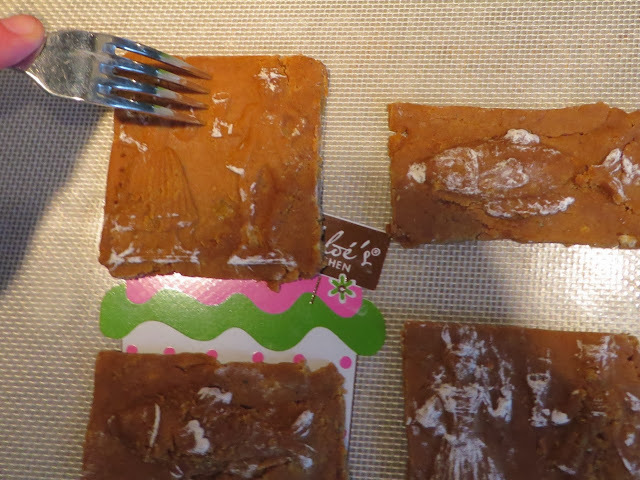 Lastly and most enticingly, we made what's known as block gingerbread. The unleavened gingerbread I made is far from bread; but more like very hard, very spicy cookies, the kind you dip in wine or coffee, and is a treat with hundreds of years of history behind it. Consisting of nothing more than flour, butter, spices, sugar, molasses, and if wanted, dried fruits*, the dough is pressed into squares with molded patterns on top, and baked in an extremely slow oven until -- well, ours are chewy crisp, but I imagine they should become quite hard. No leavening, not even eggs, in this recipe and earlier ones**. It was baked commercially and sold all over England, but the spicing and shapes remind me strongly of Europe, too, so I'd imagine similar breads were popular there. 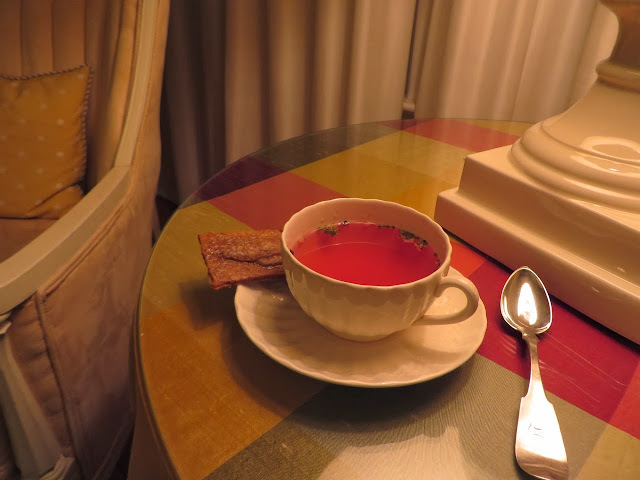 A gingerbread cake with a cup of tea make for a civilized evening. Yes, the tea is decaffeinated. Sigh. 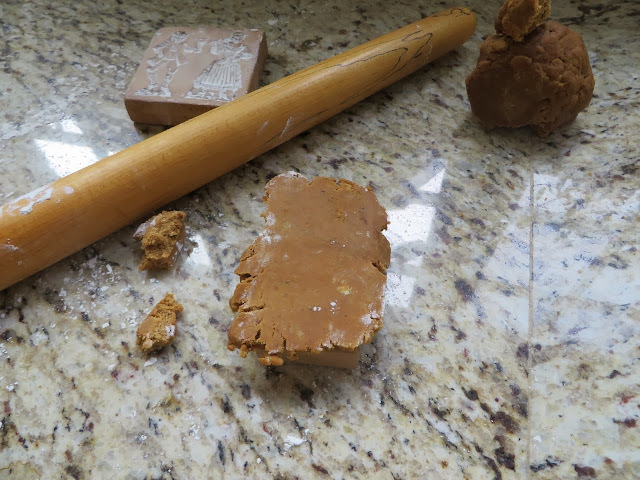 I'd read about this block gingerbread in Ivan Day's mesmerizing Food History Jottings blog, and had determined to make it. This was our first opportunity. *Even older recipes were based on nuts like almonds, or breadcrumbs. **As time went on bakers started to use leaveners, like vinegar mixed with the molasses, or various leaveners like hartshorn and later baking soda, etc., until gingerbread turned into a fluffy sort of cake or quick bread. The gingerbread cakes look like they will keep well, because there's really little to spoil***, and they taste divine: gingery, deeply complex with cardamom, coriander, mace, cinnamon, nutmeg, cloves, and more ginger, what England calls mixed spice. The only thing to get used to is the consistency, since today's soft or easily-snapped-crispy they are not. 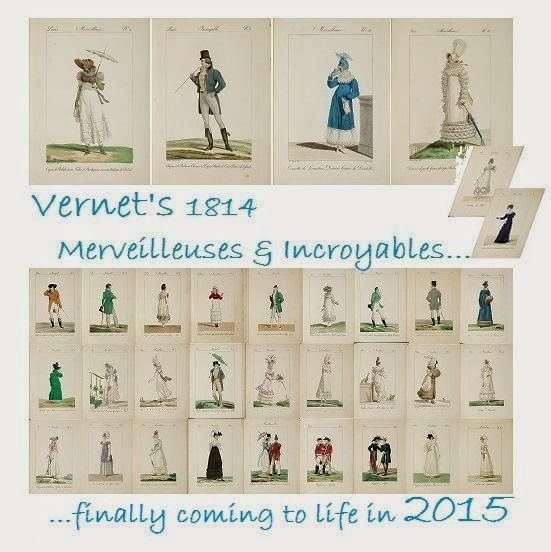 They are perfect companions for coffee, or hot chocolate, or wine, and nuts and other after-dinner sweetmeats. Oranges, dates, that sort of thing. Besides, they're very pretty to look at. While not tasting or being at all like them, these gingerbread cakes remind me of beeswax, candles, port, and good Stilton. ***Indeed, Ivan Day transcribes one recipe, for almond-based gingerbread, that directs the maker to bake the gingerbreads hard, and they would keep "all the year". 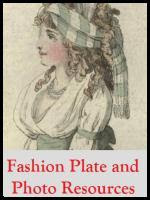 If you're wanting to recall the 17th century, or the Georgian, Regency, or Victorian eras all in one iconic morsel, why not try them? The only thing you'll want to prettify them is some sort of mold...a butter mold or spingerle mold will do, and I am just itching to sculpt my own in clay. Lacking a mold, you could try them just flat, cut with a cookie cutter. Oh, and you'll need time to bake them. They take hours in the oven, and of course you want to be there while they dry...for it's really drying more than baking. Granted, our first batch is less than shapely: I got antsy, and after they'd baked an hour and seemed soft as ever, turned the oven *way* up to 250. D'oh...the dough softened and the features of the molded designs began to dissolve. Down went the temperature again to 200 for another hour and a half and they could have stayed in longer. I let them dry overnight before packing the cakes into an airtight tin. Batch no. 1: Our ladies and gentlemen are dissolving into history, and the fish are melting. Still, you can tell they are designs of some sort. Ivan Day's recipe, straight from Frederick Vine's Saleable Shop Goods (London, 1898) is commercial-sized. Have you 8 pounds of flour ready? Not being so obsessed that I wanted to eat gingerbread until Lent, I took the recipe down to 1/8th size. Here it is. I go by weight, as being more accurate, but you could try the American measures, although they are rounded off and very wobbly, because pounds and ounces are measures of mass, while cups and teaspoons are measures of volume, and the two don't compare well. *Mixed spice: Mix up one part each of allspice, cinnamon, nutmeg, cloves, ginger, coriander, and two parts mace. Your "parts" could be tablespoons or teaspoons, just so the proportions are retained. From BBC Good Foods. Please note: I added more spice this time. Commercial makers would have been careful of costs. I wanted a truly strong result, to remind me of the oh-so-powerful Pfeffernuesse I knew in Germany. In a nice deep bowl, work the flour into the butter until it's entirely incorporated: no lurking butter bits, please. I used my very cold hands to mix everything. Work in the sugar, peel, and spices. Hand work again. Now, bit by bit, pour in enough dark molasses to make a stiff dough. I suspect I used more than a half a cup, but how much you will use will depend on how damp the weather is, and the properties of your flour. Again, I used my hands, because I could feel the dough coming together into a ball, and getting soft enough that I knew it would both roll and take a pattern from a mold. If you have made pie crust before, your hands will know when the dough is getting to be moldable. Unlike pie crust, there is less butter here -- the dough is not "short" and fatty -- and of course the cookies will dry hard, so you can work this dough a bit. If you haven't made pie crust, here's what you might look for. I am no expert on this recipe, but I do know doughs pretty well. You want the dough to hold its shape in your hand. It should not want to crack and crumble, a sign that it's too dry. Nor should it be sticky from too much molasses. If it's sticky it will stick to the mold, not peel out. Now, the original recipe says to let it sit a bit. What's a bit? I left it an hour, baked a first batch and left the remainder overnight. Further reading of Food History Jottings and Ivan Day's website confirmed what I suspected, that this dough can sit and mature, the spices becoming ever more mingled and deep. 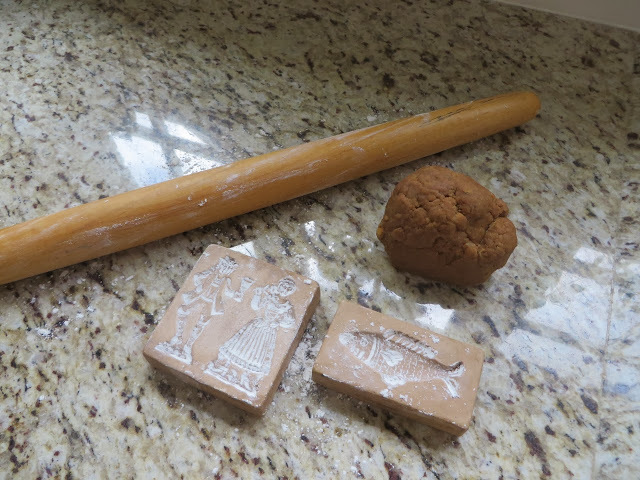 Lightly floured molds, rolling pin and gingerbread all ready. Rolling the gingerbread down onto the mold. Approximate thickness I made my gingerbread blocks. I guessed on the thickness, and spent a deal of time examining Ivan Day's productions on both his blog and his site. Cut around the edge of the mold. Slowly peel the bread block off of the mold. Cutting the gingerbread block to shape. 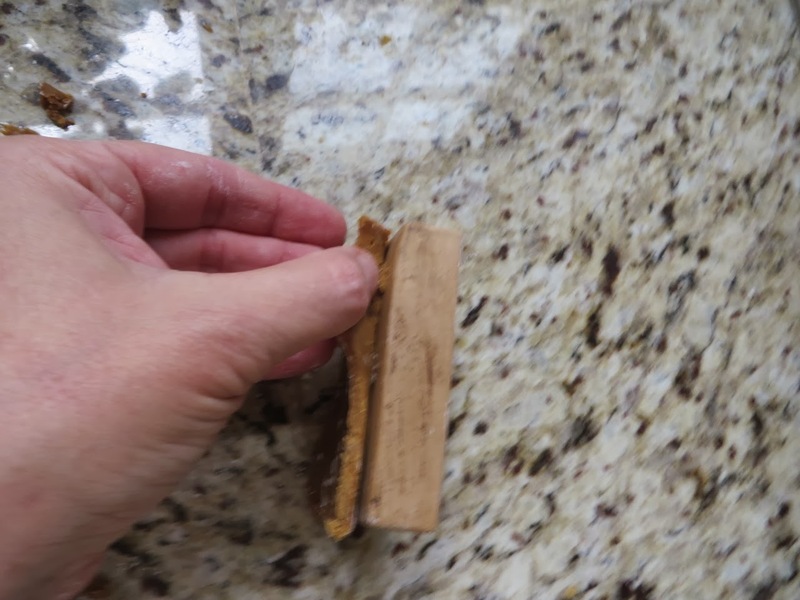 Peeling the gingerbread block from the mold. Carefully transfer the cake to a barely greased cookie tray, or better yet, a tray covered with a Silpat. "Dock" the gingerbread cake: poke holes in the top to deter any puffs. 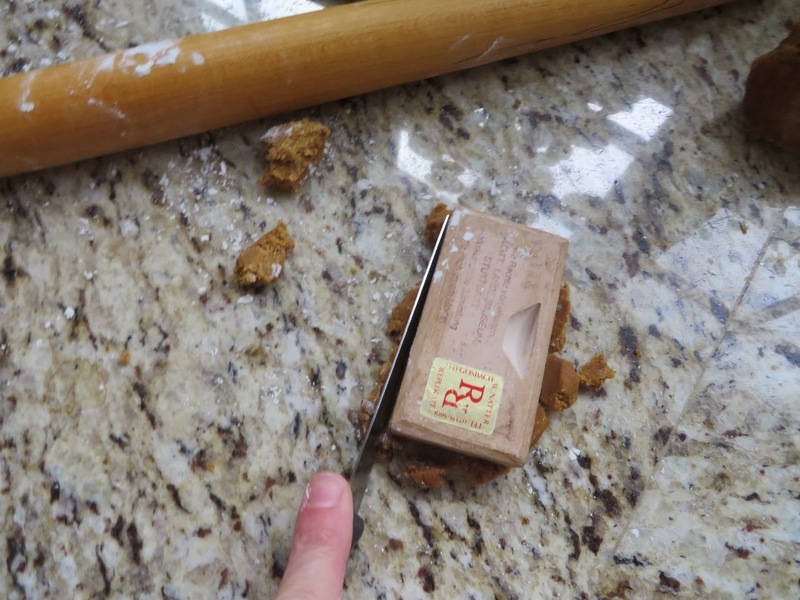 Mine didn't puff at all: there was nothing for the molasses to react to, such as baking soda. 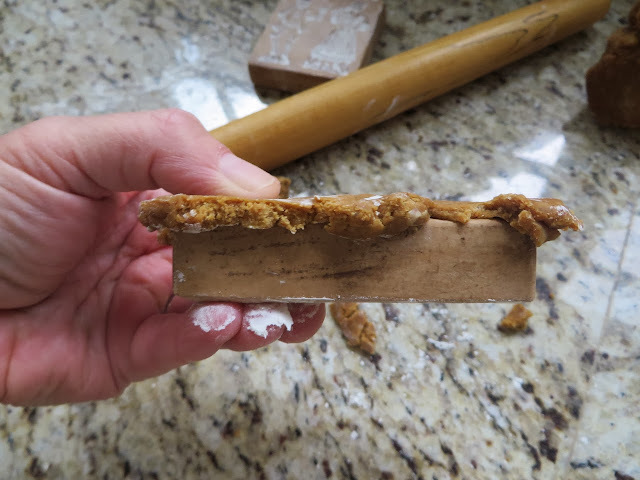 Commercial gingerbread makers used to have a special tool for docking, but I used a fork. Docking the gingerbread blocks with a fork. 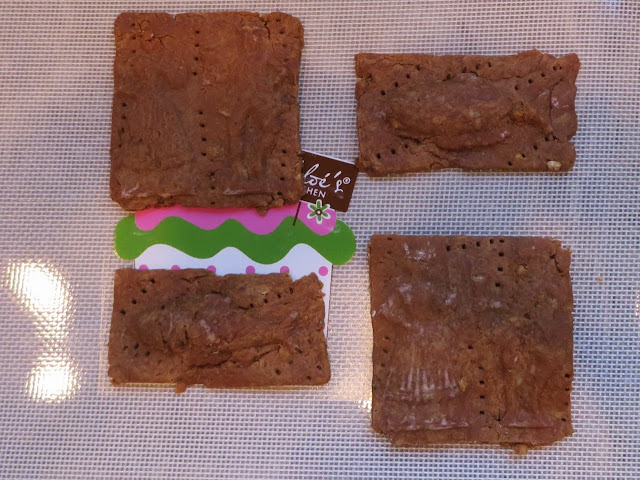 Bake in a cool, that is, 200 degree Fahrenheit oven, until the gingerbread is rather hard, though chewy inside. I am guessing on the eventual hardness of the result. Ivan Day says nothing about this, but his oldest recipe transcriptions speak of the cakes being baked hard. This took me three hours on the second batch. After a day or two the cakes become harder. How long the hardening goes on, I don't know...to really keep long they'd have to be dry as bricks. Remove the gingerbread cakes from the tray. Brush with a glaze of mixed water and powdered sugar, not much, just enough to shine the surface a bit. This is my guesstimate of what Frederick Vine's "Bun Wash" might be. What a title... Put the cakes onto a cookie rack to dry thoroughly overnight. Finished gingerbread cakes. Oh look! The lady on the right must be Bruenhilde: see her floury, horned helmet? Pack in an airtight tin. See how long they last! Next time I am going to add a bit of fruit vinegar to the molasses, and let it cause some rising, then let the sponge age in the refrigerator for a few days before baking it. We'll see what changes this makes to the results. So Where's That Blasted Gauze Cap? It's coming along, it really is! As the project progressed, I found myself more interested in testing to see how the sewing process, and the results, would change depending on what seams I used. 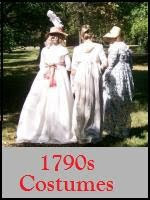 Why might an 18th century seamstress choose a particular seam? Next post will explain a great deal more, and who knows, it may show a finished cap. What a great way to spend time during frightful weather! I meant to as well, but was too busy sewing and such. Indeed, regardless of hemisphere. Ah, Stollen. A huge favorite here, although I've not had it with marzipan. What a good addition. Everything tastes better with marzipan. looks yum! Love following Ivan Day's blog. I truly wish all the wonderful scents from the oranges,lemons and the dough would linger through the screen - I have to imagine them instead! 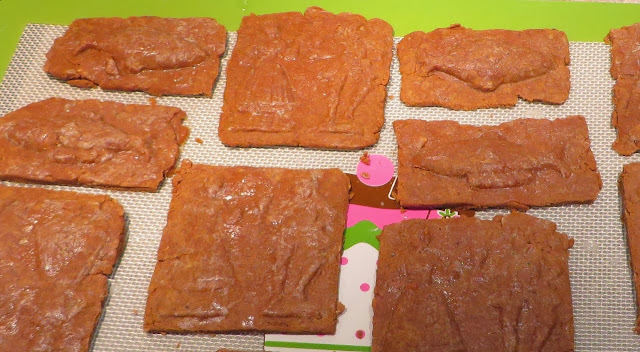 I wonder wether your gingerbread is similar to our 'Lebkuchen' or more to 'Gewürzspekulatius'. We usually put the latter in those molds, too. But the ingredients of gingerbread remind me more of our 'Lebkuchen', which actually gets crisper by storing it (you can store it for weeks and still eat it). Spekulatius, yes, I remember those! They are very tasty. Lebkuchen may be closer though, I think, at least in flavor. Hmmm, "Leb-kuchen", "life-cake"? Being in a Middle Earth mood, I wonder if this may be a source of lembas, the elves' waybread? Although I would make it of an old grain like spelt and ground beech nuts or almonds, and flavor it with lavender and a hint of rose, and medicinal flowers -- you might know better than I on those. Make it of things that could conceivably grow in Lothlorien. Then it could keep for a year, so long as it was wrapped well. Interesting to think about. So perhaps you could also decorate with shaped powdered sugar or a foil star! Ooh, what a good idea! I could even gild them, since there's food-safe gilding out there. What fun...the people could wear crowns and the fish swim under stars. The moulds were a gift from a sister in Germany many years ago. She got them at a museum which had copied their own wooden originals. You can find them on Etsy these days.